Valverde Commons was conceived as an active adult CoHousing community in 2006 and developed from pastureland starting in 2011. Currently there are 22 energy efficient houses with 6 additional ones expected by 2023. Thirty four people live in the community as of 2018. 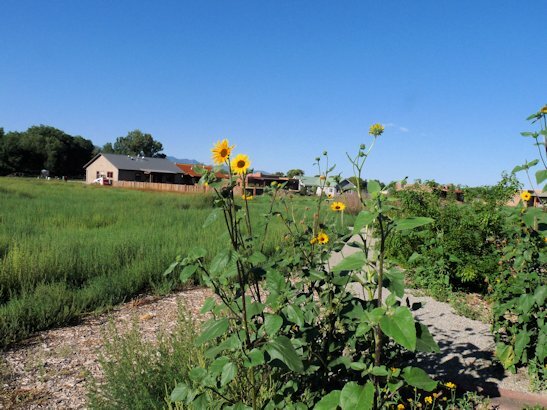 The community is located in the heart of Taos, New Mexico and a short walk from the historic Taos Plaza. The individual homes are clustered on 10 acres surrounding an almost 4 acre common green space, plus an adjacent 10 acre park with walking paths and gardens. Our beautiful common house has a full kitchen, large meeting room, library, and laundry facilities. It is frequently used for group dining, parties, meetings, classes, and entertainment. The common house has rooftop solar energy to promote sustainability. We also have a barn building for communal garden tools, tractor, and garden carts. The barn also includes a complete professional wood working shop and other studio facilities. Valverde Commons provides the feel of an old-time neighborhood where everyone knows everyone else and frequently get together for group meals, educational and recreational activities. The network of paths around the commons area provides neighbors easy opportunity to meet and commune with each other. Adjacent to Taos’s historical district, Valverde Commons is within easy walking distance of Taos Plaza, the Taos library, stores, art galleries and restaurants. Valverde Commons includes a diversity of people of different backgrounds, incomes and viewpoints who want to live harmoniously. We have a number of resident artists and feature art shows in our Common House. Valverde Commons has considerable neighbor participation in group activities such as potluck dinners, garden work days, astronomy sky parties, hikes, movies, horseshoes, educational discussions and decision making management but we also have a policy of voluntary participation in all these events. As a community, we get along well. We are committed to aging in place as much as possible. We are not health-care professionals, but we expect to be helpful neighbors, supporting each other physically, emotionally, and spiritually as we age. As of summer 2018, we have two houses for sale. One of those houses may be rented for short times to experience CoHousing. Email us for more information and visit our website (www.valverdecommons.com).